A delegation of Pacific Council members traveled to Sacramento in October for a Water Scarcity Field Foray, an educational trip about water policymaking and dispute resolution, as part of the Global Water Scarcity Initiative. In addition to Pacific Council members, the delegation included Enrique Lomnitz, founder of Mexican social enterprise and Pacific Council strategic partner, Isla Urbana. The trip was facilitated by water expert Alf W. Brandt, senior counsel to the California State Assembly Speaker and expert on water resource law and policy. The Pacific Council has had an ongoing partnership with the Speaker’s office on water-related issues since July, when we co-hosted a panel on Urban Water and River Revitalization. The Field Foray kicked off on the evening of Monday, October 22 with a welcome dinner in downtown Sacramento. Delegates had a chance to meet and socialize, turning in early to prepare for a packed schedule the following day. Delegates reconvened on Tuesday morning at the Capitol, where Brandt provided an overview of water law and policy in California. Brandt was followed by a panel of three representatives of stakeholders in the complex San Joaquin-Sacramento River Delta dispute: Rachel Zwillinger (Defenders of Wildlife), Erik Ekdahl (Water Rights Division, California State Water Resources Control Board), and Alexandra Biering (Friant Water Authority). "The presentations, panels, and site visits provided a rich, contextual view of the socio-political and technical water challenges facing California today." After learning about the actors, interests, and tensions involved in policymaking in the San Joaquin-Sacramento River Delta, delegates got to see the region for themselves. Brandt facilitated a bus tour of the delta, stopping at the Freeport/Sacramento County Treatment Outfall, Locke, and the Cross-Channel. The final stop on the tour was the Cache Slough Wetland Complex, a manmade wetland designed by Bryan Brock of the California Department of Water Resource. Brock took delegates on a tour of the wetlands, explaining his mandate, community response to the wetlands, and policy implications. Upon returning to Sacramento, delegates met with the Chair of the California State Water Resource Control Board, Felicia Marcus. Marcus was appointed by Governor Jerry Brown to the State Water Resources Control Board for the State of California in 2012, and designated by the governor as chair in April of 2013. 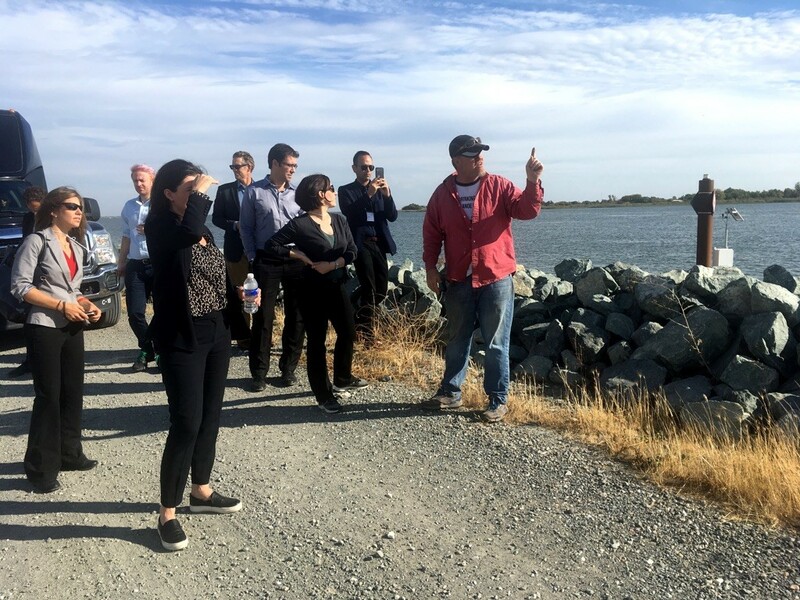 Delegates tour the Cache Slough Wetland Complex with Enrique Lomnitz, founder of Isla Urbana, a strategic partner of the Pacific Council Global Water Scarcity Initiative. "The Water Scarcity Field Foray helped me understand how my international water expertise applies to California. I was impressed by the depth and breadth of water issues the Pacific Council teed up for us in Sacramento," said participant Abby Lindsay, Ph.D. candidate specializing in global environmental politics. "The presentations, panels, and site visits provided a rich, contextual view of the socio-political and technical water challenges facing California today, and I learned a lot from both the legislative experts and other Pacific Council members that participated." Following the member-focused portion of the delegation, Pacific Council staff remained in Sacramento to meet with members of California State Assembly Speaker Rendon’s staff about future collaborations with our Global Water Scarcity Initiative. Megan Karsh is the Vice President of Initiatives at the Pacific Council, where she designs programs and cultivates strategic partnerships to impact foreign policy. Learn more about our Global Water Scarcity Project.